This summer could be your best summer yet. That is, as long as you spend it at Sparkles! We are offering a multitude of camps and events this summer that are bound to make it your best one yet! 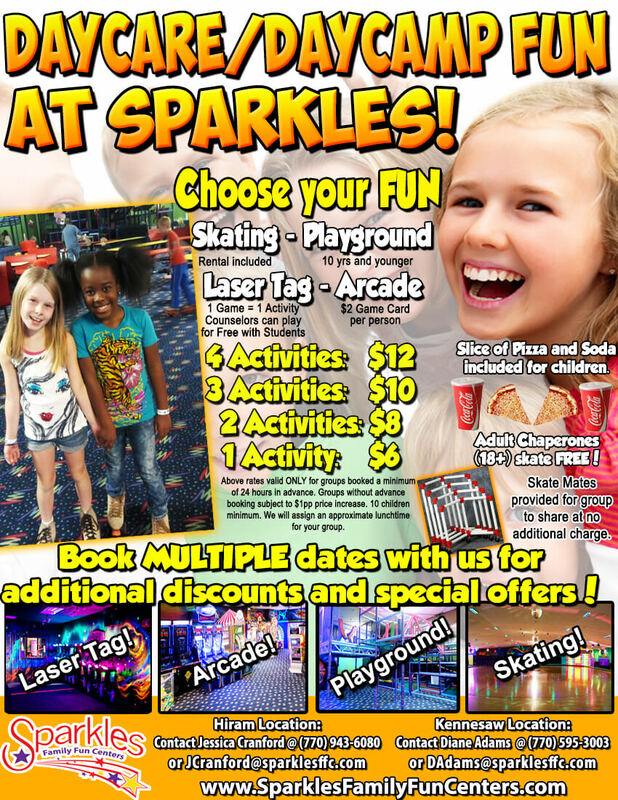 Plan your summer at Sparkles! Throughout the work week, parents can send their kids to Sparkles to participate in our affordable camps and day camps. One of our most popular attractions is our skate rink. With one of the best DJ’s in Georgia, you are sure to enjoy one of the best skating rinks with your friends listening to music that is appropriate and enjoyed by all ages. To take a break from the wheels, we have an incredible arcade available with plenty of games and activities! Set the high score on any of our games and challenge your friends to try and beat it! If black lights and lasers are your thing, take a step into our laser tag arena and compete against your friends with some of the best laser tag in Hiram, GA.
And finally, our jungle gym playground offers everyone plenty of mazes and routes that provide plenty of fun. After working up quite the appetite with your friends, grab a slice of pizza and a drink to refill your tank and get back on the rink! For our boy and girl scouts, we offer camps that are both educational and fun! Take the day to learn about the history and safety of skating, and follow it up with a skating session of your own. You can participate in any of our events and activities, as well as food and drink for just $9.50. The fun is unlimited and endless.